Operational Meteorology might be said to have begun in Ireland on 8 October 1860, when the first 'real time' weather observation was transmitted from Valentia Island in Co. Kerry. Valentia Observatory, as it came to be known, was one of a network of weather stations established around the Irish and British coastlines, by the naval authorities in London, to enable storm warnings to be provided for ships at sea. For many years after Independence Ireland's needs, as far as weather matters were concerned, continued to be met by the British Meteorological Office. By the mid-1930's, however, it was clear that a new and exciting customer was on the way. It was the requirement to provide accurate weather information for transatlantic aviation that led to the formal establishment of an Irish Meteorological Service in 1936. The first Director, Austen H. Nagle, was appointed in December of that year, and installed himself in the small offices in St. Andrew's Street in Dublin, which became the first Headquarters of the new Service. In April 1937, the administration of the existing observing network was taken over from the British Authorities; it comprised 4 telegraphic stations (at Malin Head, Blacksod Point, Roches Point and Birr), 18 climatological stations, 172 rainfall stations, and Valentia Observatory, which was the only station at the time to be manned by official personnel. In its early stages, the new Service received continuing help from the British Authorities. This assistance was in the form of staff seconded from London to work at Foynes, in Co. Limerick, from where flying boats had just begun to operate. Included in their number were several who were later to become well known internationally; notably Hubert Lamb, the climatologist and Arthur Davies, Secretary General of the World Meteorological Organisation for nearly 30 years. By 1941, however, the Service's own recruits had been fully trained, and the organisation was able to begin satisfying the increasing demands for weather information from its own resources. Forecasting for aviation, first at Foynes and later at Shannon and Dublin Airports, was the major preoccupation of the early years. By the late 1940's, however, the Service had broadened its activities. In 1948, for the first time, it assumed responsibility for the weather forecasts broadcast by Radio Éireann, which had been provided from London in the interim. In 1952 it began to supply forecasts to the daily newspapers and 1961 saw the opening of the new Central Analysis and Forecast Office in the Headquarters premises, now housed at 44 Upper O'Connell Street, Dublin. Live presentation by Met Éireann forecasters of the weather on Teilifis Eireann commenced in early 1962. Radar Antenna at Shannon AirportThe late 1940's and the 1950's were a time of rapid expansion for the Service. This period saw the establishment of a balanced nation-wide network of observing stations, manned on a full-time basis by Meteorological Service personnel. The climatological and rainfall observing networks were greatly enhanced, thanks largely to the willing co-operation of the Garda authorities around the country and the assistance of other Government Departments and State-sponsored bodies. 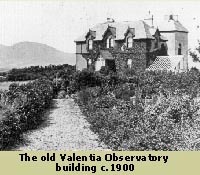 At Valentia Observatory, which had moved to a mainland site near Cahirciveen in 1892, upper air radiosonde measurements began and a wide range of geophysical measurements and environmental monitoring activities was introduced. Meanwhile, the Service offered an expanding range of forecast and climatological information to the public and to specialised interests. A notable development was the inauguration of tape recorded telephone forecasts during the 1960's, the precursor of today's Weatherdial. The reception of satellite images began in the late 1960's at Shannon Airport and in the 1970's, the Meteorological Service might be said to have come of age by entering the computer era. Initially, the new machines were employed for communication purposes, but shortly afterwards the computers were used for the relatively new technique of numerical weather prediction. Throughout its history, the Meteorological Service and its staff played an active role in the development of meteorology on the international scene. Ireland became a full member of the World Meteorological Organisation shortly after its establishment in the early 1950's and was later a founder member of both the European Centre for Medium Range Weather Forecasts and the European Meteorological Satellite Organisation, EUMETSAT. More recently, the Service has been active in the formation of other co-operative agencies like EUMETNET and ECOMET. Particularly beneficial to the organisation has been its membership since 1989 of HIRLAM, a co-operative venture between the Scandinavian countries and several other European Meteorological Services for the development of a numerical model for short-range forecasting. 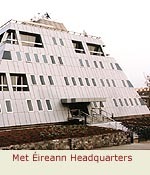 Met eireann Headquarters ImageThe modern era of the Meteorological Service might be said to date from its occupation of the new Headquarters Building in Glasnevin in 1979, a development which for the first time allowed all the Dublin based Divisions to be housed under the same roof. It was around this time too, that the Service reached its peak in terms of staffing, with a total of 342 in 1980. The intervening years have seen a gradual reduction in staff numbers to the present level of 230, a development brought about mainly by the introduction of automated methods for many repetitive tasks, and by on-going review of our priorities with regard to weather observations. In March of 1996, its 60th year of operation, the Meteorological Service adopted the new title Met Éireann, with the aim of establishing a well-focused corporate identity in the public mind. Proud of its record of public service, its development of the national meteorological infrastructure and its contribution to the science of meteorology, Met Éireann looks forward with confident optimism to the challenges that lie ahead. Note: Provision of forecasts is subject to a fee. Note: Provision of services is subject to a fee. The Irish Laser Association remains one of the numerically biggest classes in Ireland – over 200 boats on the books – and when you get over 100 boats on average (across the three rig types, of course) at each of the four regionals and Irish Championships, you know you have a very healthy scene. Click here for all the latest up to date Laser Sailing News. National Champion James Espey of Ballyholme defended his title in Howth to beat clubmate and main rival Ryan Seaton by almost ten points in the 11-race event. It won’t have come as a shock to the rest of the fleet since he wasn’t outside the top four in any of the other Laser events during year and also won the Munsters. Ronan Wallace of Wexford made the most of local knowledge to win the Leinsters while Ryan Seaton and Rory Fitzpatrick took the Ulster and Connaught titles respectively. In the 4.7 rig division, Diana Kissane of Howth showed she had coped with the transition from the Optimist class she dominated for years by taking the Irish Championship title on home waters. Not a bad feat considering she only sailed in one other major event. The other regionals were won by Howth’s Andrew Tyrrell, Eoghan Cudmore of Kinsale and Philip Doran from Courtown (who also won the Topper Nationals). Battling for the honours in the Radial rig division were Barry McCartin of Cushendall, Chris Penney of Carrickfergus and Debbie Hanna of East Antrim, with McCartin winning two regionals and the other two taking one each. At the Nationals in Howth, it was UK visitor Alison Young from Stokes Bay who topped the 51-strong fleet with McCartin the best of the Irish in the runner-up spot. Hanna had the consolation of winning the Ladies’ Nationals at Ballyholme while David Nelson had an impressive win in the Masters event at the same venue. National Champions (as at March 2009): Standard rig – James Espey, Ballyholme YC; Radial rig – Alison Young, UK, 4.7 rig – Diana Kissane Howth YC. It has been nothing short of an extraordinary summer for Irish sailing, with plenty of silverware shining in club trophy cabinets around the country. Results in the early spring perhaps were an obvious sign that the summer would deliver something special. Within a month, Peter O’Leary and Tim Goodbody won the Star Spring European Championship, Annaliese Murphy won the Dutch Europa Cup and Matty O’Dowd followed this with a victory in the Danish Europa Cup, both sailing Laser Radials. Preparations for the summer were on track. These results were impressive, but they turned out to be just a taste of what was to come. The highlight of the summer arrived with Murphy’s eighth place in the World Laser Radial Women’s Championship, which secured her the Under 21 World Title. Murphy is just 19 years of age, and this is her first year on the senior circuit. The current World Champion is 31, putting Murphy’s potential into perspective. Her result was Ireland’s first top ten finish at an Olympic Class World Championships in six years, and was secured in an 87-boat fleet that included the American Olympic gold medallist Anna Tunnicliffe and the Chinese Olympic bronze medallist, Lijia Xu. The title was won by Finland’s Sari Multala who counted five race wins in her scores, allowing her to sit out the final race. The National Yacht Club sailor improved throughout the 12-race series, where individual scores included a second placing, moving the UCD mathematics student from fifteenth to tenth in the penultimate days sailing in Karatsu. The following week at the same venue in Japan, the Laser Radial Youth World Championships were held with 100 sailors from 25 countries competing. Philip Doran and Oliver Loughead finished ninth and 12th respectively in the overall standings but more significantly they picked up the Under 17 World Title and Silver Medal between them. Doran has shown his true grit as a competitor and has made a remarkable transition from the Laser 4.7 class where he won the Under 16 World Title in 2008. How many Irish sportsmen can say they won a world title two years in a row? To top it all off, RCYC Optimist Sailor Cian Byrne did the business on the final day of the UK Optimist Junior Nationals in Largs in August. Cian’s three third places on day 6 of the 12-race series were enough to beat USA sailor Jack Johansson, GBR sailor Freddie Grogono and Cork club mate Peter McCann. Cian’s achievement is reported as a first for Irish Optimists in a British Championship and was richly deserved. Peter was the other hero; having led for much of the championship, he put up a great fight in the final series and ended his event with a very creditable 4th overall. The junior (Under 12) event had 145 competitors and had a truly international flavour with sailors from France, Holland, Spain, USA and UAE competing against the IRL and GBR contingents. The Irish more than held their own with two other top ten results, Sean Donnelly (7th) and Adam Hyland (10th). Indeed, Team Ireland had seven of the top 20 junior spots, with GBR taking just eight. More encouraging still is the presence of other sailors ready to challenge those on the podium. At the Topper World Championship, 13-year-old Finn Lynch secured second place, which bodes well for his career. At the 420 World Championships, Jane Butler & Jenny Andreasson finished 11th overall. This duo are both eligible to compete in 2010 for the youth title. Their result comes after great use of their transition year, facilitated by the Royal St George Yacht Club’s Youth Sailing Scheme. Seafra Guilfoyle finished 50th in the European Optimist Championship, our best at this event for at least eight years and Fiona Daly finished 40th in the equivalent event for girls. The results are a significant boost for the ISA’s Performance Pathway, spanning from Junior right through to Olympic campaigning. ISA Youth & Development Manager, Rory Fitzpatrick has managed the ISA Academy since 2005 and deserves great credit for the results achieved to date. Annaliese Murphy is the Irish Independent/Afloat.ie 'Sailor of the Month' for August 2009 after her impressive showing in the Laser Radial Worlds in Japan. Racing in the first week of August, the 19-year-old National Yacht Club sailor was advancing a potential Olympic campaign with competition in an 87-strong fleet which included US Olympic Gold Medallist Anna Tunnicliffe and the Chinese Bronze Medallist Lijia Zu. In the end, the new champion was Finland’s Sari Multala, but apart from the Finn’s unbeatable scoreline of five wins, one of the most notable achievements was the steadily improving performance into the top ten by the Irish sailor. Murphy improved from fifteenth to tenth overall on the second-last day, and then with increasing confidence she finished in a convincing eighth overall. We have only to look at the calibre of the sailors in her wake to realize that this was a serious step towards the London Olympics of 2012, and Annaliese Murphy becomes a worthy representative of Olympic and dinghy sailing in our roll-call of sailing stars in 2009. The International Optimist Dinghy Association in Ireland – or IODAI – represents the Optimist class in Ireland and internationally. IODAI is affiliated to the Irish Sailing Association (ISA) and The International Optimist Dinghy Association (IODA). Click here for all the latest Optimist news. 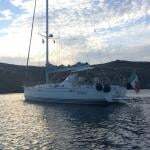 To sail in IODAI events you need to become a member. You can join at Registration at any event but it’s often best to come prepared with a completed application form which you can download here. The Optimist is, quite simply, the dinghy in which the young people of the world learn to sail. Sailed in over 110 countries by over 150,000 young people, it is the only dinghy approved by the International Sailing Federation exclusively for sailors under 16 years of age. Over half of the dinghy skippers at the last Olympic Games were former Optimist sailors. The boat was designed by Clarke Mills in Florida in 1947. Optimists first came to Europe in 1954 when a fleet started in Denmark. Most parents find that sailing gives young people a great sense of personal achievement. In addition the skills required to improve sailing performance both on and off the water; it helps young people develop a more organised approach to other non-sailing related activities. How many Optimists are there in Ireland? More than 1,300 Optimists have been registered in Ireland (2008). At Optimist events in Ireland this year the fleet size varied between 120 at Regional events and 200 at our National Championships. International events can be much larger and at an Easter Regatta on Lake Garda in 2008 there was just short of 1000 boats. How can i join a sailing club that sails Optimists? Contact the Irish Sailing Association where you can find out which sailing clubs are local to you. The junior or dinghy sailing coordinator in each club should be able to tell you if they have an active Optimist class in that club. Your interest could be the spark that ignites an Optimist interest there and IODAI will endeavour to support clubs who wish to start an Optimist fleet. Alternatively, if you contact the IODAI secretary directly, [email protected] you will be put in touch with an IODAI regional representative who will guide you towards a suitably active Optimist club. IODAI contact every sailing club from time to time to determine their level of interest in the Optimist class and to maintain an open invitation for any sailing club to seek assistance in the forming of an Optimist class at that club. Which are the more prominent clubs racing Optimists in Ireland? Are Optimists suitable for girls? The Optimist provides superb one design racing where boys and girls can compete on equal terms. Yearly rankings often produce a 50:50 split between boys and girls. In 2005, 2006 and 2007 the Irish National Championship was won by Diana Kissane, from Howth Yacht Club who set a record by winning the title in three successive years. Why is Optimist Sailing so popular in Ireland? The first Optimists arrived in Ireland in 1966. The class in Ireland developed relatively slowly until 1978 when a batch of 35 GRP boats was imported and Ireland first sent a team to the World Championships. In 1981 Howth Yacht Club hosted the Worlds and boats sold off in Ireland after the event gave the class a big lift. – Is your child a competent swimmer? (Competent means comfortable in the water when out of depth and capable of swimming say 25 meters in the sea water while dressed in normal clothing). – Is your child comfortable about the prospect of trying sailing? (The prospect of being alone in charge of a boat is often daunting to a young child and this introduction to the water is the most important step). – Are there any older brothers, sisters or friends involved in sailing? This is often a great help. – Is the child and are the parents prepared to make the commitment? There is a lot of time involved in junior sailing. Parents, remember, they can’t drive themselves to training or events and they need lots of help ashore especially in the early days. My child has done some sailing courses at our local club, can they start sailing Optimists at events? Of course. The Optimist dinghy is a simple and safe; designed specifically for young sailors. So, no matter what other boat they have used on their courses, they should be able to handle an Optimist. When do they start racing? As a Junior Class we have knowledge of helping sailors make the transition from 'messing about in boats' to actual racing. This is where our innovative Regatta Fleet comes in. What is the Regatta Fleet? Regatta Fleet Racing is for beginners and unranked sailors – usually from age 8 upwards. The focus of the Regatta Fleet is on having fun. There is a Regatta Fleet element at most major Optimist events except 'The Trials' (for information on 'The Trials' see the New Parents and Sailors section of our FAQ’s on the website). The Regatta Fleet will could be your sailors first experience of racing. They can enter the Regatta Fleet once they have learnt to sail to windward and can negotiate a simple triangular course. A typical Regatta Fleet day is usually shorter that the main fleet. With some coaching in the morning, a break ashore for lunch and then some simple races in the afternoons, the aim is to make the introduction as easy as possible. It’s not taken too seriously and coaches are allowed to give advice during racing. If a sailor is towards the front, advice may not be necessary and the coaches will tend to concentrate on those near the back. And yes, there are prizes, and it often proves to be the most charming part of the prize giving ceremony where we see very young children collect their first sailing trophy. Regatta Fleet Racing at events gives the younger sailor the experience of doing circuit events without the pressures of racing way out to sea over long courses. There are often around 50 boats racing and it’s their first introduction to the wonderful circle of friends that sailing produces for all of us. While the Optimist calendar is a full one and parents/sailors may find the implication of a serious Optimist programme just a little bit daunting - the truth is that most young children (and parents!) find the experience lots of fun. The combination of the training, regional events, and regattas, gives young sailors lots of opportunity to make new friends from all over Ireland (and indeed abroad in the case of sailors attending international events). Lots of sailors make friendships on the Optimist circuit which endure well after the age limit has been passed. And the parents? You will meet literally dozens of new friends. All are not sailors. Some are; some aren’t. Like your children, you will form friendships that will endure long after your sailing hopefuls have progressed out of Oppies and are old enough to travel to sailing events without you. It’s not just all about the children!! We need some fun as well. In March 2009, Afloat's Graham Smith wrote: "Officially, and not altogether surprisingly, the Optimist ranks as Ireland’s biggest one-design class with 275 boats registered with the IODAI. It remains the boat of choice for beginners in clubs across the country and it still encourages highly active racing fleets in 18 venues. Numbers are up by over 12% on the previous year and with fleets at regional events averaging 100 and almost 160 at the Nationals in Tralee, there doesn’t seem to be any slowing up at all, although its popularity north of the border has apparently slipped in a number of locations. In the Junior fleet, it was a memorable season from Seafra Guilfoyle of RCYC who won Easterns, Westerns and Northerns before taking the national title in a 90-strong junior fleet. Seafra was also the highest placed Irish helm in the British Nationals Junior fleet, finishing eighth overall out of 170 boats. The senior division was more evenly balanced, with Colm O’Regan (KYC), Jamie Aplin (RStGYC) and Killian O’Keeffe (RCYC) winning the regionals (O’Keeffe winning two) before Cork’s Richard Harrington won the Irish Championships in Tralee ahead of 67 others to make the nationals a Cork double success. National Champion: Senior – Richard Harrington, Royal Cork YC; Junior – Seafra Guilfoyle, Royal Cork YC"
Situated on the west shore of Strangford Lough, the Club has a good landing pontoon which gives easy access to all local facilities. However, there is no overnight berthing at the pontoon. Members cruisers are moored in 2–4 metres SSW of Town Rock. 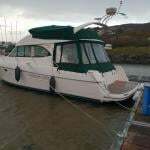 Visitors are welcome to anchor outside the moorings. Club members race Cruisers, Flying Fifteens, Lightnings and dinghies. KYC is the most centrally positioned Yacht Club.